(TORONTO, ONT.) 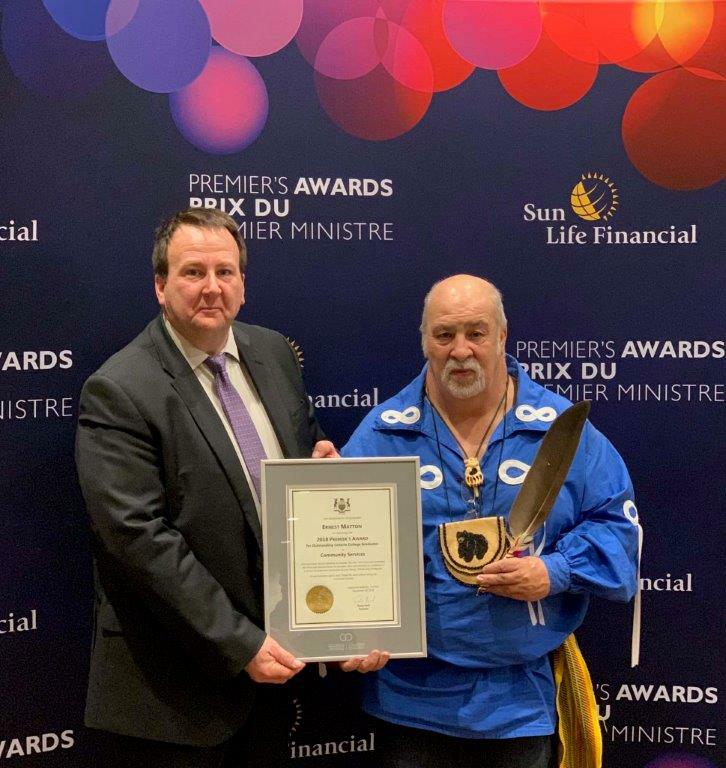 -- Canadore College is pleased to announce that Ernest Matton, Elder Little Brown Bear, Premier’s Award nominee, took home the award for Community Services category last night. Elder Little Brown Bear is a proud alumnus of Canadore’s general arts and science, and drug and alcohol counsellor programs, and is the manager of Indigenous culture and the Aboriginal healing program at the Michael Garron Hospital-Toronto East Health Network. Over nearly 25 years, Métis Elder Little Brown Bear has developed a holistic model to treating addiction and mental health issues by blending Indigenous teachings and ceremonies with mainstream Western practices in an award-winning approach to addictions treatment for Indigenous and non-Indigenous populations. Matton’s healing program takes its participants on an intensive healing journey to address emotional and mental traumas. His popular program purposely has no wait-list and client intakes have doubled in the last six years. Matton has received many accolades, including receiving the Governor General of Canada’s Sovereign Medal for Outstanding Indigenous Leadership, an investiture into the Order of Ontario, the Centre for Addiction and Mental Health Difference Maker Award, the Canadian Addiction Counsellors Certification Federation’s Barb Robinson Indigenous Excellence Award, and the 2018 Canadian Urban Institute David Crombie Award. Matton also holds an addiction education program certificate from McMaster University and a bachelor of education in Aboriginal education from Brock University. Elder Little Brown Bear says that his time at Canadore helped him to learn about the holistic relationship between trauma, mental health and addictions, which in turn shaped his ability to help pain sufferers. The annual Premier’s Awards honour the important social and economic contributions made by college graduates to the province and to the world. Nominations are submitted by Ontario’s 24 colleges and are presented in six categories - Business, Creative Arts and Design, Community Services, Health Sciences, Technology, and Recent Graduate - and are reviewed by a selection committee. The winners were acknowledged at a gala event at the Sheraton Centre Toronto Hotel on November 26. Canadore alumni Kelly Crawford, (2016), Elina Katsman (2013), Peter Rowntree (2007) and Ted Hargreaves (1999) have also been recognized as Premier Award recipients for their outstanding contributions in their respective fields.